For a limited time only you can have an A-rated Glow-worm Ultimate2 30kw boiler with Glow-worm MiGo App based remote radio frequency programmable room thermostat for just £1395.00 (subject to terms and conditions), incuding a 10 year manufacturers warranty. Call us today to find out more. Status Heating offer a wide range of commerical services. Contact Us to find out more. Status Heating is proud that it is becoming unique in the marketplace as one of the last medium sized, family owned businesses, able to give the highest level of personal service and priority to its customers. We have over 60 directly employed technicians throughout the Greater Midlands for an immediate response. Our in house Contact Centre is open 7 days per week from 8am to 9pm including Bank Holidays. Our sophisticated mobile data systems and vehicle tracking help us attend and complete jobs quickly and efficiently. Certification is provided electronically. Status has been run by the same family for over 38 years. We understand the importance of customer care. We take great pride in the quality of our service. We are ISO9001, ISO14001, APHC, MCS, OFTEC and RECC Assurance certified. Don't let other people tell you that warm air heating is old and out of date. We love it! 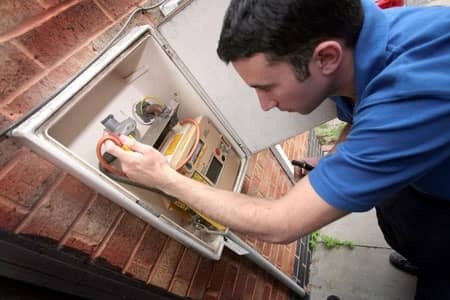 We can repair, service and replace all makes and model of warm air units. "Your workforce was most efficient, pleasant, polite and a delight to have them in my house"
"We wish to thank everyone at Status for the excellent job of replacing our warm air central heating"